Based on Meg and Mog Books by Helen Nicoll and Jan Pienkowski. 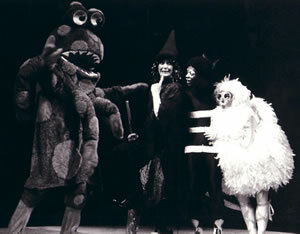 Unicorn Theatre commissioned MEG AND MOG SHOW and produced it at the Arts Theatre, London, starring Maureen Lipman, for the 1981 Christmas season. 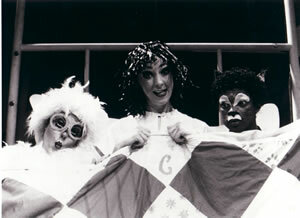 The show was revived by Unicorn four times, and then toured nationwide by Westwood Productions. There have been notable rep. productions in Bristol and Derby, and in 2002 at Brentwood Theatre. It has been popular with amateur companies too. A production in Romania was very well received. 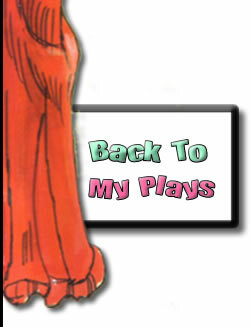 The play brings to life for children the familiar figures from the books they know and love so well. Ingeniously combining stories from five of the books, we see Meg, Mog and Owl set off on an adventure to find the ingredients for a spell to get rid of an invading Stegosaurus – an adventure that takes them to a medieval castle, zoo and the moon. There are lively songs and plenty of audience participation. David Wood writes : Directing MEG AND MOG SHOW for Unicorn proved a regular delight for more than ten years! Following the wonderful Maureen Lipman in the title role, we were fortunate to secure the services of the equally splendid Amanda Barrie, Sarah Greene and Leni Harper, who also played the role on tour. Jan Pienkowski co-designed the show, which faithfully reproduced his unforgettable book illustrations. A cartoon animation television series is in preparation. 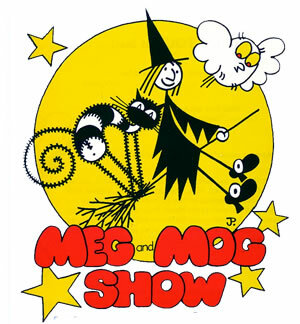 Hopefully this will spark off more productions of MEG AND MOG SHOW in the future. The original production employed eight actors, although it is possible, with doubling, to be played by seven. A school production could increase the size of the cast by adding animals in the zoo scene or by giving the stegosaurus more legs! A choir could provide support in some of the songs. “MEG AND MOG SHOW is a stirring tale of Meg’s messy magic in which she tries to cast a spell on a rampaging stegosaurus with the aid of a white knight, a retired tiger and a helpful zoo keeper by way of a journey into space in a cauldron.